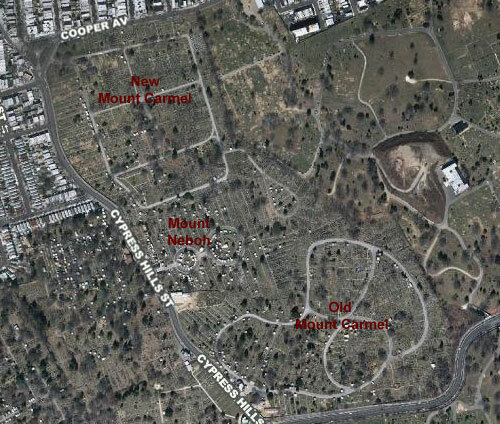 Mount Carmel Cemetery consists of two large sections that straddle Mount Neboh Cemetery in Glendale, Queens. 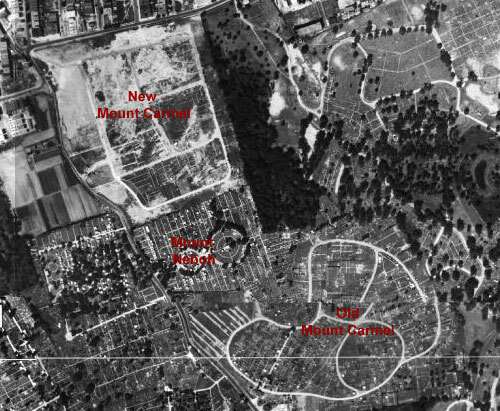 Old Mount Carmel was founded in 1906 on a large parcel of rolling terrain situated on the south side of Mount Neboh Cemetery and just north of today’s Jackie Robinson Parkway. A decade later, New Mount Carmel was established on a tract of relatively flat land between Cooper Avenue and Mount Neboh. Together the two sections contain about 100 acres and over 85,000 interments and include the gravesites for some of the most important individuals in Jewish American history. The Honor Row at the entrance to the Workmen’s Circle plot at Old Mount Carmel is home to a pantheon of artistic and political heroes of the Eastern European immigrant working class of late 19th-early 20th century America. Buried here are dozens of labor leaders and writers who gave voice to the Jewish proletariat, including Meyer London, the first socialist elected to U.S. Congress, Abraham Cahan, the founder of the renowned Jewish daily newspaper the Forward, anarchist writer Saul Yanovsky, and socialist poet Morris Winchevsky. Also here is Mount Carmel’s most famous resident, Sholem Aleichem, the great Yiddish writer whose stories inspired the musical “Fiddler on the Roof.” Sholem Aleichem’s 1916 funeral drew hundreds of thousands of mourners and was the largest New York City had seen at that time. He was originally interred at neighboring Mount Neboh Cemetery but was reinterred at Mount Carmel when the Workmen’s Circle created the Honor Row in 1921. Among the other famous individuals at Old Mount Carmel are Bella Abzug, the first Jewish woman elected to U.S. Congress, and members of the Adler family acting dynasty that began with Jacob Adler, a legendary figure of Yiddish theater. 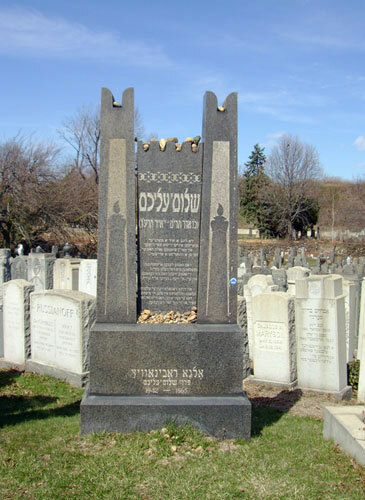 New Mount Carmel has its own share of notable residents, including comedian Henny Youngman, but is also distinguished by its section for recent Jewish immigrants that features row after row of the large, black granite monuments with etched portraits that are favored by Jews that came to New York after the collapse of the former Soviet Union. Monuments of recent Jewish immigrants at New Mount Carmel. View more photos of Old Mount Carmel Cemetery. View more photos of New Mount Carmel Cemetery. Sources: Mount Carmel Cemetery; A Living Lens: Photographs of Jewish Life from the Pages of the Forward (Newhouse 2007), 219; The Jewish Search for a Usable Past (Roskies 1999), 120-145; The Jewish Communal Register of New York 1917-1918, 336-337; “In Mourning, Traditions Mingle,” New York Times, Oct. 28, 1997; “A Reading to Recall the Father of Tevye,” New York Times, May 17, 2010; NYCityMap.